There is more to Christa Forrest's paintings than meets the eye, which is significant because there is also quite a lot that does meet the eye. The first clue that there is something more complex going in her paintings is the figures’ many gazes throughout her portfolio. The gaze gives a directionality to the canvas – the locus of focus is off canvas. The eyes point to the left, to the right, inwardly with closed eyes, or directly at the viewer. In all instances the women are looking beyond the perimeters on which they are painted; they are seeking something more and refusing to partake in art’s role as an aesthetic object. Beneath the surface, Christa’s paintings are empowering portraits women that mix feminine and religious symbols to convey an existential awakening of the female spirit. Christa takes the conventions of religious Byzantine icons, such as otherworldly backgrounds and haloes, and masterfully manipulates them to create powerful artwork that examines themes of identity, power, and individuality. NB: To keep the comparison tidy, this article will work primarily within the evangelical tradition, though parallels can be made to a myriad of theologies. The most crystalline instance of Christa’s converting religious symbol into feminine symbols is her treatment of haloes. In traditional religious artwork, a halo is the symbol used to designate a holy person. In Christa’s paintings, the figures’ haloes are made of hair. Each face is surrounded by a powerful mane. The choice is significant and deeply telling. Not only is hair often associated with feminine beauty, it is natural and part of the body. Rather than separating spirituality from the body, spirituality is made inseparable from the body. 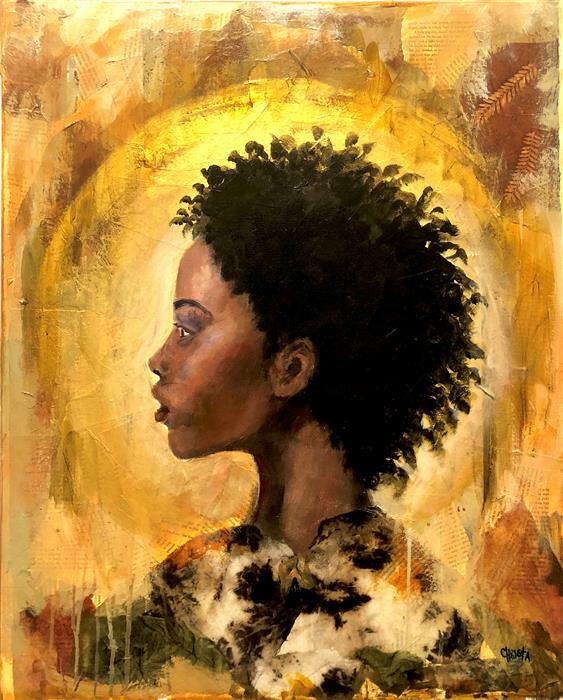 The collective portfolio is titled “The Emerging Goddess.” Christa chooses the singular goddess, rather than the more enumerating plural goddesses. This choice expands portfolio to all women, rather than pin it down to the dozen specific women represented in paint. This suggests that there is a larger project at work; the paintings are symbols for a larger, collective emergence. The word choice of emerging is also significant. Emerging – the gerund form of the verb – suggests a process or journey that is unfolding. The women are moving away from obscurity and into clarity. Christa reinforces this idea stylistically. While the faces of each figure are clear and realistic, the backgrounds are blurry and abstract. This motion reverses the chronology of art history; Christa puts abstract art behind, representational portraiture. The figures are moving from away from the nonrepresentational abstraction of their backgrounds, into representation. This mirrors the rhetoric of spiritual journeys; the enlightened gain understanding and knowledge. See Christa's full portfolio on UGallery.